Quinoa is a great alternative to Bulgur wheat for making tabbouleh–not that there’s anything wrong with bulgur. 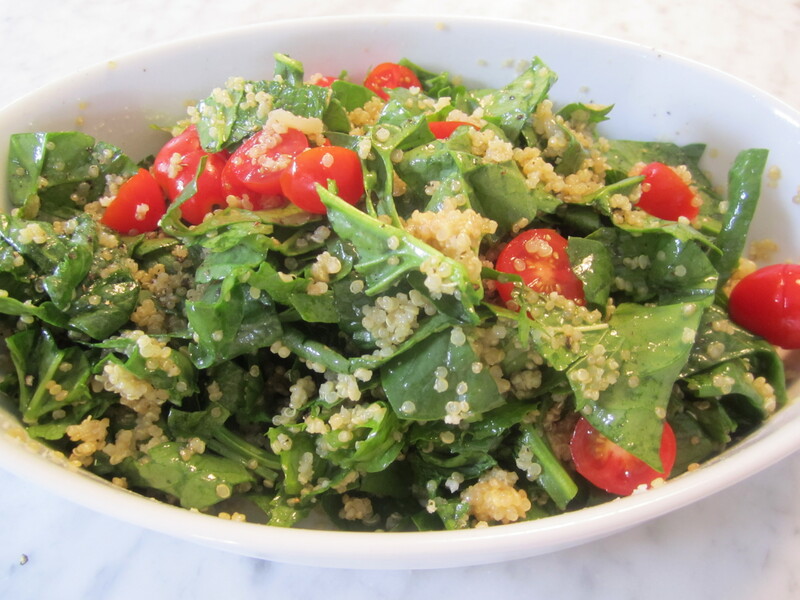 I just happened to have a large bag of quinoa in the house, and tabbouleh sounds great on this very warm summer day. It’s still spinach season, so I’ve added lots of chopped spinach, plus parsley, mint tomatoes, lemon and olive oil. This is a bright, assertive but refreshing dish. Diced cucumber would be great, although I don’t have any in the house today, so I skipped it. I don’t add raw garlic or scallion because I don’t like them, although most recipes for tabbouleh call for one or the other. This dish is great as a lunch on its own (sprinkled with some feta) or a side dish to grilled meat. It’s great cold from the fridge or at room temperature. Combine all ingredients and taste–add salt and pepper.